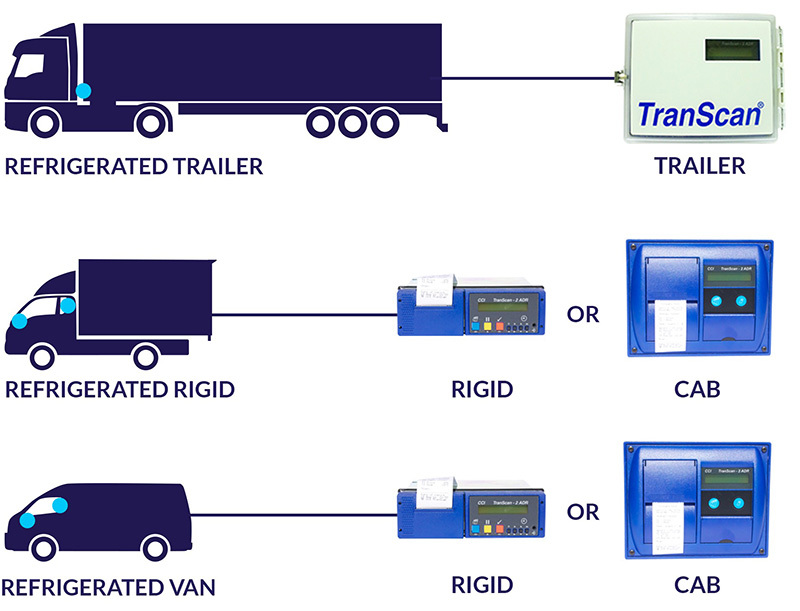 Leversedge are authorised partners and specialist installers of Transcan temperature data loggers that are used in multiple types of vehicles, cold stores and applications. TranScan® temperature recorders are proudly manufactured in the UK, and are recognised as the world’s most widely used road transport temperature monitoring device. These units are supplied in three different fitting types, the external and weatherproof Trailer type, the Cab type for mounting internally in the bulkhead and the Rigid type for mounting in the DIN (radio) slot. TranScan® 2 temperature recorders have been type tested and approved against the EN 12830 norm for vehicle temperature recording systems and are certified as a Class 1 device. This is the highest classification of performance that can be awarded. Not sure which Transcan is right for you? please see the diagram below. Click on the links below to learn more about the Transcan Temperature Data Loggers.